Back in late 2010, I built a very small split ring telescope. Split ring telescope examples are out there on the internet (and here’s another example), but they’re a lot bigger than the one I built. Building a split ring mount for a 3” telescope was both easier and more difficult than building a larger one, since on one hand I didn’t have to work with huge things, but on the other working on such a small scale meant I didn’t have a whole lot of room to work. While I was doing this, I was also teaching myself how to use power tools. 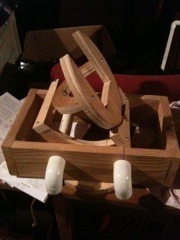 This is the ring and cage for the split ring. The main ring part is what rotates on the RA axis, while the semi-circle in the back is what supports the ring so it can both rotate on the dec axis and hold up the rest of the ring. The quarter circle provides support. Later I drilled a hole in the back for the RA axis and attached wood clamps on the sides of the vaguely “U” shaped hole in the middle. More on those later. The mount was assembled from some wood and PVC I happened to have laying around. 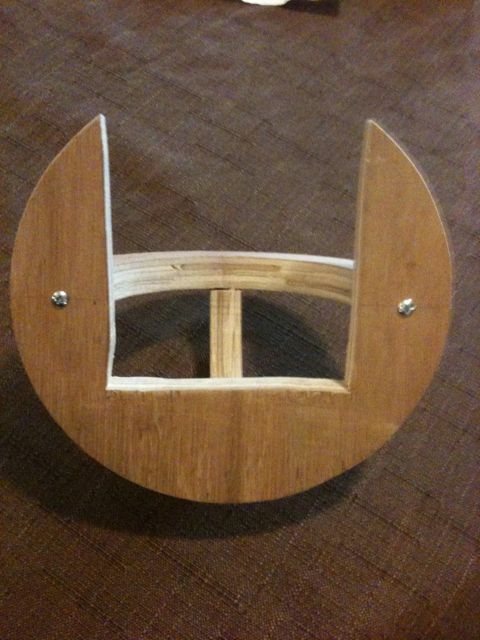 The split ring sits in a rocker which it turn rests in a cradle. This particular cradle was made of cedar and PVC I happened to have laying around. 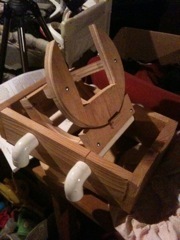 The cradle was made of cedar and PVC I happened to have laying around. 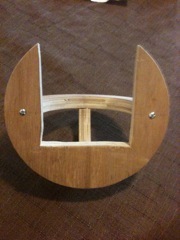 The rocker can be aimed at the appropriate angle for your latitude and held in place with a little clamp. I made one out of bits of wood and some rusty bolt I found. There’s a bolt in the back that it rotates on its RA axis that can be loosened and tightened. 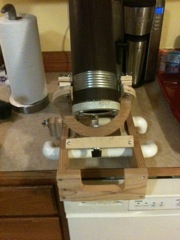 The telescope tube itself was an old 3”, kind of beaten up but sufficient for this. One problem with it is that the focuser and secondary are all one thing and as far as I can tell made of cast iron, so it’s really heavy. It makes balance on it difficult. I drilled holes in it to put some bolts through for the dec axis, but had to put them pretty far back to fit in the ring. This is what it looked like once it was all put together. 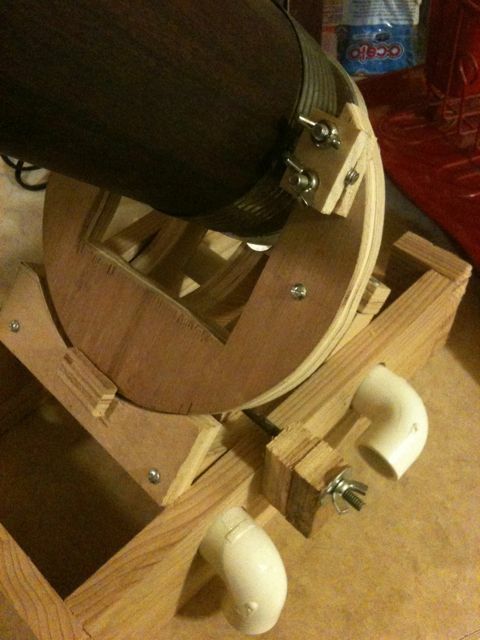 The dec clamps on the side were a bit troublesome. In the years since I put it together, those wooden clamps on the side there ended up cracking. I need to make new ones to be able to use it again, but those things are so tiny it’s rather difficult. Those clamps are one area where it would be easier to work with a larger telescope. 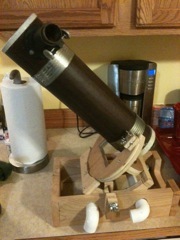 Because of its smallness, it’s a somewhat impractical telescope, but it was an interesting thought experiment. I’ve used it once or twice, but that’s it. It doesn’t move real smoothly (although better than you might expect), and because of how small it is there wasn’t a whole lot of room to work. This little guy has a special place in my heart, though, since it was my first ATM project, and while it could have been better the design’s sound. I built it more as an experiment to test out the general theory than anything else else, and it worked out great for that, paving the way for other ATM projects while it was at it. Since I built this, I converted an old Meade DS-16 to a Dobsonian (which I’ll write up later), and I have vague notions of getting an objective lens from Surplus Shed and making a long focal length refractor. There’s even other projects I’d like to do further down the line, like making a Cassegrain, but that’s for the far future. Oddly enough, the first project I had intended to do was to build a larger split ring, but then the conversion opportunity came up with that Meade DS-16. That thing has a 16” mirror, so the split ring for that would be big enough that it would be difficult to get out of the door of my garage and really difficult to fit into my car to take out to the dark sky sites. I’d still like to build an actual big and useful split ring, though. The Dob I built is pretty nice and not all that hard to use (and not at all mechanical either, so it was simpler to build and has less stuff to break), but sometimes I wish it was an equatorial. I really like having a scope I can pack up and take places, but perhaps in the distant future when the kids are older I can take over more of the yard and build a dome with a nice big split ring inside.